ICFF! 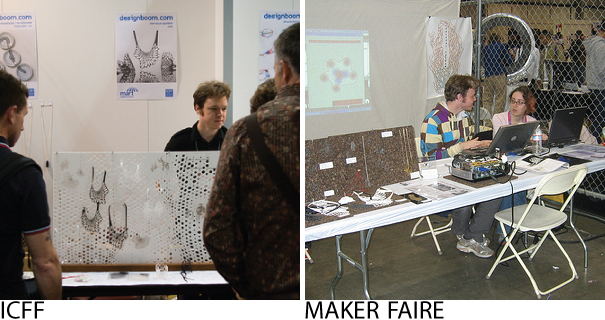 Maker Faire. Radiolaria applet improvements. From May 17 to May 20 we will be exhibiting at the International Contemporary Furniture Fair with designboom. That is one week from tomorrow. Since we got back from San Francisco a few days ago, we have been working like crazy to get everything ready. We designed a display wall last night with we hopefully have time to have made before the event. Also coming is fancy new packaging, business cards and other goodies. Lastly we went to the Maker Faire and met a lot of cool people. A few people were able to make their own patterns using our applets at the booth and then hop over to the fab lab to make them. Unfortunately the fab lab seemed to be having a lot of issues so not many people got to cut things. Jesse made a lot of improvements to the Radiolaria applet. Now you can use a lasso tool to cut out a pendant from the mesh. Also the applet generates the cut files with proper offsets everytime you save. That means you can order your own custom radiolaria jewelry in steel now. Also a smoothed version is coming soon because Jesse wrote a subdivision curves method. I made these diagrams to show the effect of the tools in the radiolaria applet so you can understand the variety of forms you can create with the applet. ← Nervous System in El Pais, 2.1 million readers!